Spring is here. Let's pretend you’re a baby bird for a minute. You tap tap tap away at your shell, finally break out, and what do you see? Yes, you probably do see your Ma, but what else (assuming you can see at all)? That’s right. You see your well-constructed cosy little nest. Home. Your special place where you will be nurtured until you can fly with your own wings. One of the social service managers recently asked “What’s the common thing with all this welfare reform, vulnerable children, investing in services for outcomes, family court changes stuff etc ?” Like many of us, he was trying to sort all those threads currently on the agenda into something manageable which did not overwhelm. Maybe ‘home’ or rather having one that works is a vital common thread. Home provides an anchor from which we can do other things. It's even much easier to be poor when we have a home, simply because it's easier to live cheaply. "To grow up in a safe, happy and supported environment where you are encouraged to develop and reach for your dreams." "Make sure young people are supported as well as their families. This is through ensuring they receive proper income, live in a safe and loving environment, as well as having a healthy, warm and safe living environment." There is a short short (1 page summary), an executive summary (quote source), and a full summary. Sadly, having a decent home did not fit with any of the questions in the Green Paper, so it does not feature much in the submission summaries. About a week after the submission release, Every Child Counts published its commissioned ‘Netherlands Study’ which identifies whether there are specific policies contributing to that country’s high child wellbeing outcomes with the potential to help NZ do better for children. The Netherlands achieves a very high OECD ranking in outcomes for children and spends less than half per child as countries such as Denmark who have similarly high scores. Recommendations include: promoting parent support and education programmes known to be effective (e.g. Early Start), paying more attention to post-natal depression, expanding out of school care (OSCAR), increasing the voice of children in decision-making, being able to track vulnerable children, better indicators of child wellbeing, and a dialogue between Dutch and NZ officials - and a collection of recommendations on housing. "Solutions to Child Poverty in New Zealand" from the Children's Commissioner's experts' group and is worth a read. First, it has some solutions to child poverty. Second it draws all sorts of useful links to other things that inter-connect. Third, it has some just plain good ideas on stuff that could make our country better. Fourth, for those who like to impress, this report is a good short-cut to knowing a whole lot of useful policy boffin-type info fast. Guess what - the report suggests including housing as a priority in the National Infrastructure Plan (NIP)which would enable access to "a portion of the 17 billion which Government has allocated to the NIP projects over the next four years" (p.27-28). Auckland nests are in really short supply. Why we do not connect this with vulnerable children and other aspects of welfare reform is beyond belief. Government’s own Department of Building and Housing forecast the city could be 90,000 dwellings short by 2031 back in 2010. You’d think there would be a race on to get building. The Salvation Army thought that too, but the big build is just not happening. The Sallies latest report Adding it all up: the political economy of Auckland’s housing tries to find explanations for the inaction. The report provides a readable document around policy failure, and unfavourable political and institutional contexts. Urgent action is needed to counter 30 years of ingrained ideology and policy that has led to some Aucklanders growing rich through property speculation, while others live in overcrowded houses, in sheds and in caravans. Suggestions include an affordable housing agency, and an explicit agenda around inequality. Ministers Tony Ryall, Hekia Parata and Paula Bennett did launch the ‘Supporting Vulnerable Children Result Action Plan’ (22 August) which targets four areas: building on record immunisation rates, reducing the rate of rheumatic fever, increasing participation in quality early childhood education and reducing the number of assaults on children. In case all this sounds very familiar, that's because it is. All these things have been announced as part of Government's Better Public Services goals. There is a teensy bit about looking at housing quality in the rheumatic fever section. 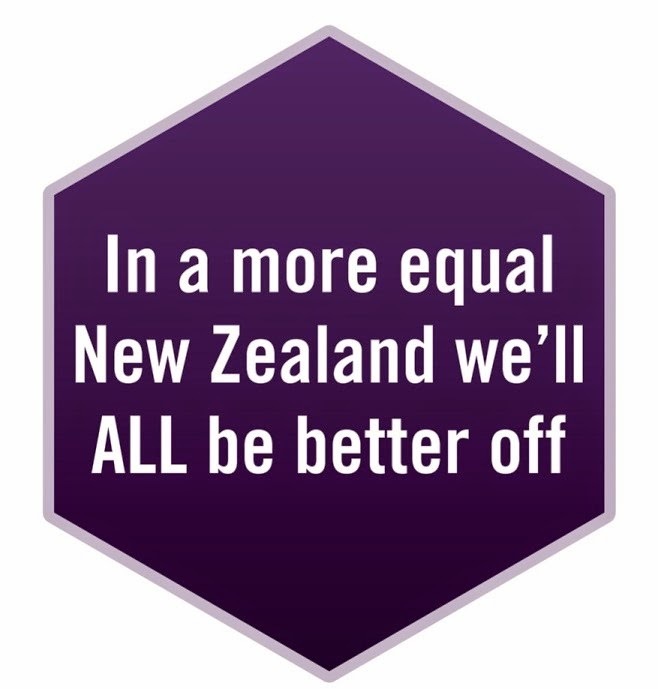 If all of this is not enough, the latest info about household incomes in Aotearoa shows "inequality is at its highest level ever as low earners' pay packets decrease while high earners are paid more" (see report details in 'Resources' section below). September 4th marked the second anniversary of Cantabrians unambiguous reminder we all live on shaky ground. Two years on some have fixed houses, some don’t. Some pay bills on one house and live in another house and so pay bills on two houses. Some have left town or rather a city which has lost so much of what was "that the city's name, Christchurch, ... seems to have become anachronistic, irrelevant." There are insurance company stories, EQC stories, and many are just plain tired, chronically stressed and grumpy. This month’s issue of Touchstone documents how it is and what needs to happen. “It must be a plan for city and suburbs. It must put people at the centre of the recovery.” “…those who developed the plan did not include religious groups in their understanding of how culture and heritage will be represented in the rebuilt city. “Let us be a city where all people matter, including those who lack economic resources. ..." "Let us be a city where small business can flourish. ... " "Let us be a city where citizens rather than property owners and investors participate in the planning and running of our city and our communities. ... "
Quotations from articles and comments by Mary Richardson, Mike Coleman, and Mary Caygill Touchstone p.10 – 11. People on benefits with a work test attached will be sanctioned if they refuse job opportunities which require a drug test or if they fail a test from July 2013 according to the Minster's announcement on 28 August. "Where people fail a drug test or refuse to apply for a drug tested job, they must agree to stop using drugs or their benefit will be cut by 50 percent." Failing a second time means having your benefit suspended until you agree you will provide a ‘clean’ drug test within 30 days. If we don't do this, then our benefit gets cancelled. People with 'proven' addictions will be supported to get help, while those on some prescribed medications will be exempt. A quick glance at the Cabinet paper suggests legislative change will be required here. We're not too sure of the details here, but the Minister's latest announcement is if there is any suggestion you are not either clearing or challenging an arrest warrant in a reasonable time, then your benefit will be stopped or reduced by 50% if you have dependent children. It gets reinstated once the warrant is cleared. Maybe we've got it wrong, but we see horrible situations where a warrant is 'unwarranted', a person has problems challenging the unwarranted warrant, then loses their benefit, and there is no suggestion of repayment of missed payments once everything is sorted out and it is finally reinstated. 1. Support the The Greens' Income Tax (Universalisation of In-work Tax Credit) Amendment Bill which is a chance to reduce poverty for children of benefit dependent parents. 2. Look at some of the fundamental things that might help - Bryan Gould has some ideas which include improving living standards of those actually in work. Both the Greens and Labour support the Living Wage campaign. 1. Lifewise is developing a range of early childhood education (ECE) programmes in partnership with Methodist churches and communities across the Auckland region tailored to meet the needs of a particular community e..g. work with a Samoan immersion preschool in Mangere, and with the Otara Tongan Methodist Parish and Ministry of Education to build a new Tongan immersion centre in Otara for 70 children. 2. Ngai Tuhoe and government have agreed on a plan to manage social services for its people which will eventually lead to the iwi taking over most of the responsibilities currently provided by the state. Kate Van Heugten from Canterbury University has confirmed what must be obvious. Her work documents how stress is a biggie for too many frontline workers and managers in government and quasi government departments, non-government-organisations, health, mental health, child protection, justice, welfare, education and industry groups in Christchurch. People doing their best to improve life for their communities can also get stressed and burnt out. More info on stress and burnout is in the resource section below. The Community Law Manual deals with many areas of community and personal life and provides answers and solutions to common legal questions, including: the New Zealand legal system, human rights, legal aid, consumer law, neighbour disputes, tenancy law, privacy law, employment law, legal issues for youth, health and disability law, ACC, family law, domestic violence, wills, enduring powers of attorney, harassment, criminal proceedings, police powers, court fines and more. MSD report by Brian Perry showing median household incomes fell 3 per cent, taking inflation into account, between July 2010 and June 2011. Low income recipients incomes fell between mid 2009 and mid 2011, while high income recipients got even more. The next application round for the NGO Social Work Study Awards is now open and will close on Friday 12 October 2012 – approximately 70 new study awards will be available commencing in the 2013 academic year. Narrow response to cutting off the benefits of people with arrest warrants who someone decides are dangerous: I don't see how that will make them either easier to find, or less dangerous.